My life is often described as a constant churn of juxtaposition. Yet, I embrace the clamor of having so many lives molded into one entity. Which is why I yelp in glee when I see a perfect paradox. 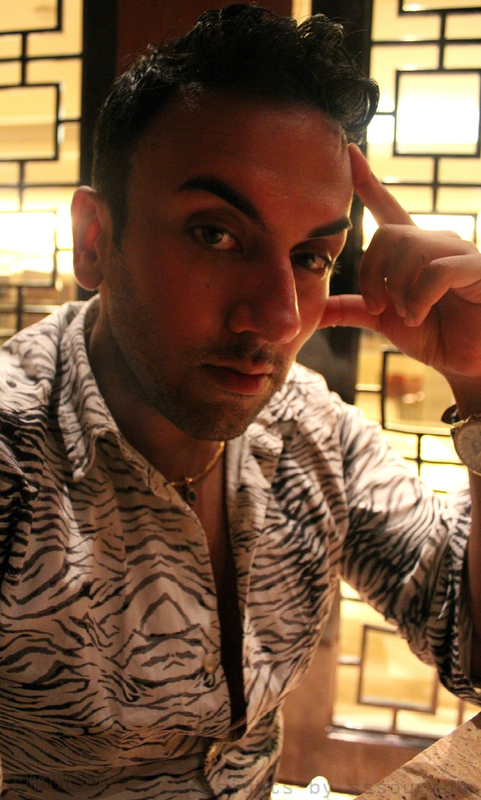 For picture this: when a day is infused with inhaling at a solemn golden gold-plated temple, pondering over a courtyard with sculptures made of waste, an award winning massage at a luxury JW Marriott, and eating street food like pani puri in the strenuous heat, you know that you are living my life. Being of Punjabi heritage, I always feel an extra strand of excitement when taking my multifaceted self back to my roots. 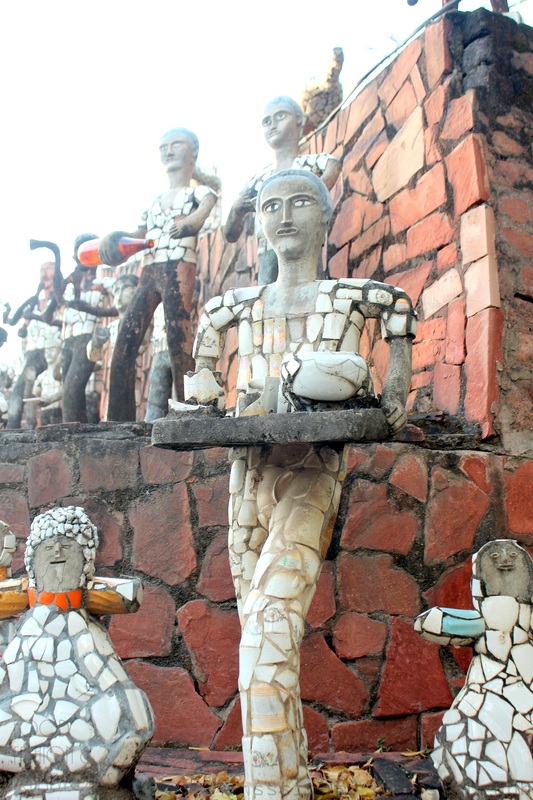 Known as the garden city of India, Chandigarh is a kaleidoscope of natural foliage, architectural wonders, and meccas of foodie dipped indulgences. 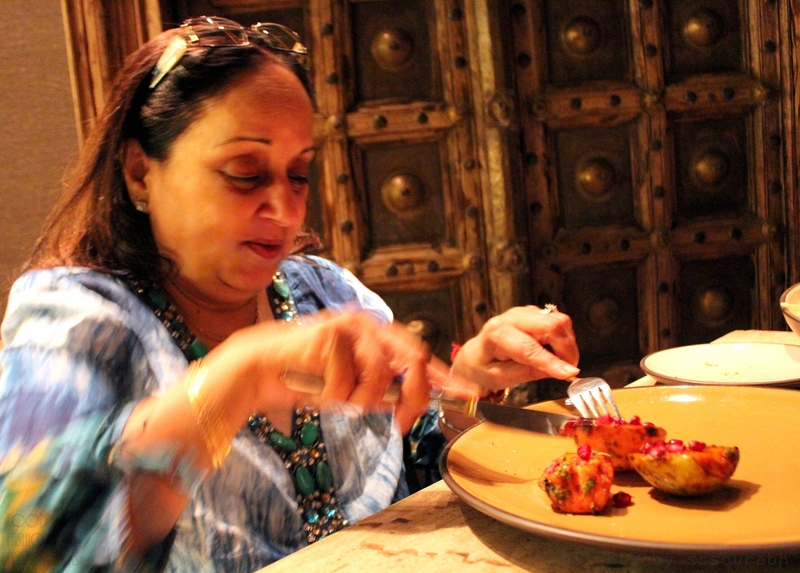 Mom actually benchmarks off of the 17th sector pani puri, which merits a review of its own. 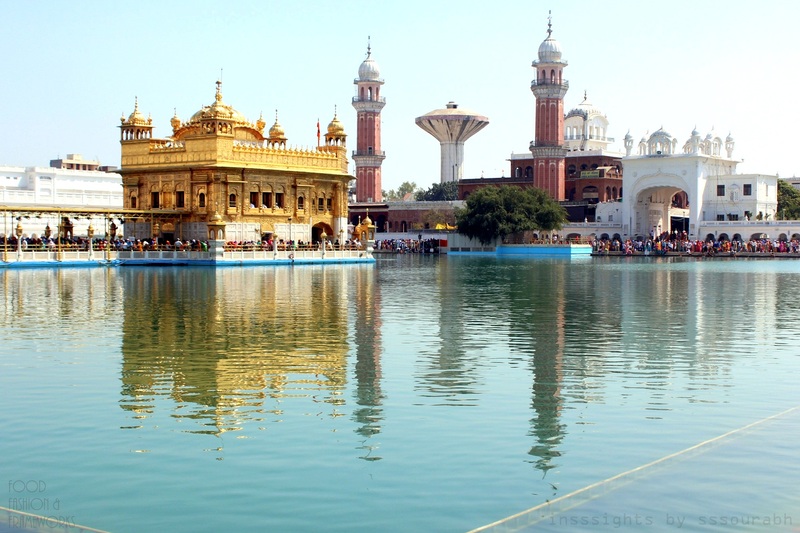 I quite like the central location, making it accessible to other areas of Punjab like the over-the-top hoity Ludhiana and the culturally charming Amritsar. 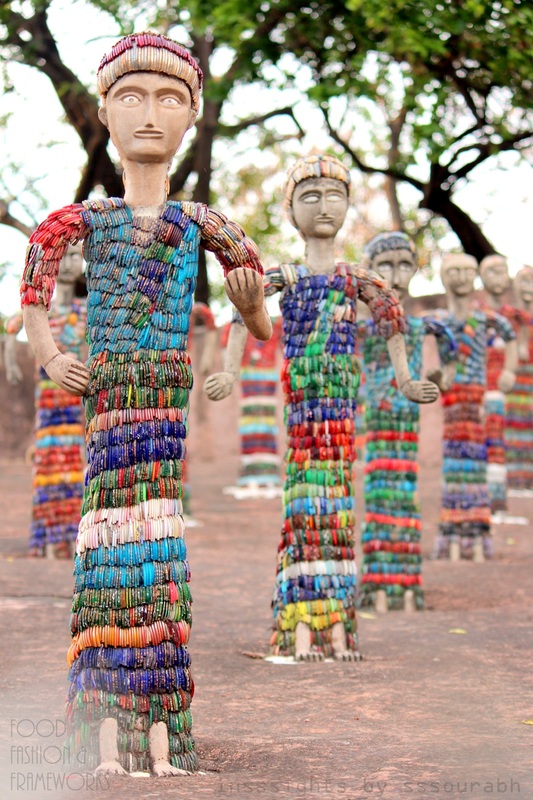 Not to mention the doting luxury hotels and spas that have cropped up, owing to Chandigarh’s reputation as a happening metropolitan in an urban landscape. 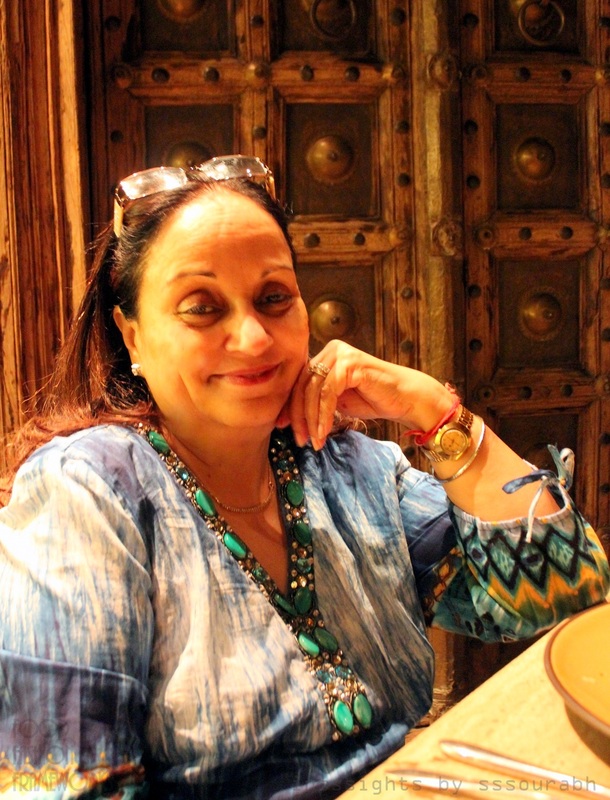 As such, my parents and I, tired from a day of wandering and shopping and eating, relaxed in our luxe suite and, while hoping to venture outwards for an adieu meal, chose to settle for an inner-hotel one. 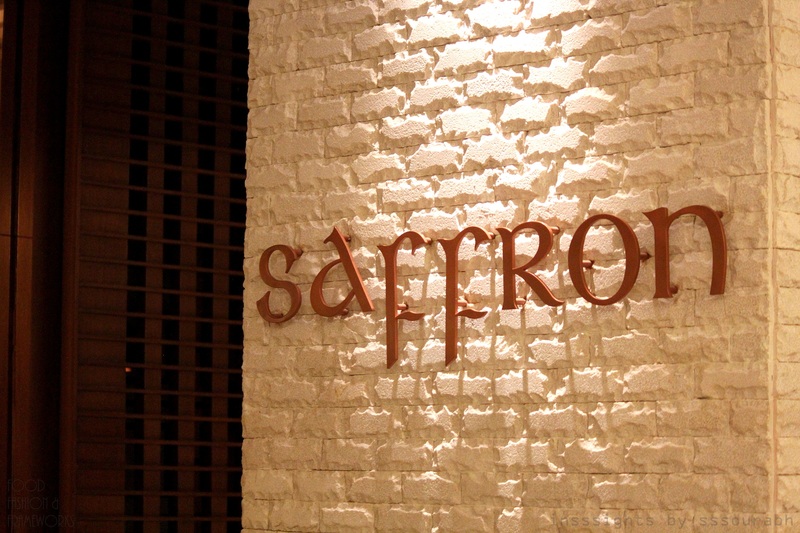 Awarded one of the best North Indian foodie finds in Punjab, the heart of North India itself, and with a name for a flavor that is instantly foodgasmic, Saffron, our choice was made easily. 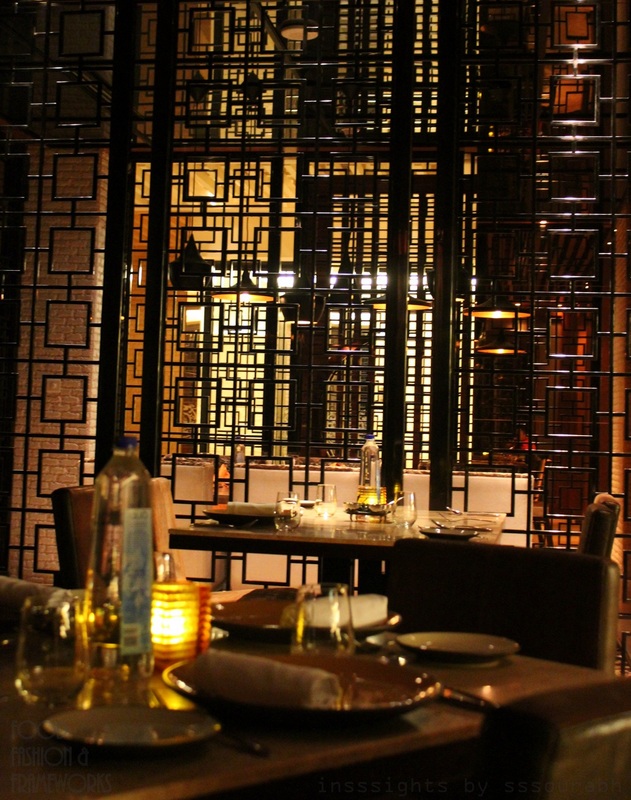 Multi textured decor and dim lit wooden structures lighting made for a cozy setting, yet layered with enough reflective mirrors and glass work to retain a luxury feel. Accents like brickwork walls untarnished with kitsch paintings, and traditional looking stone-wood-metal symmetry pattern doors reminded us of being in a contemporary Indian setting. 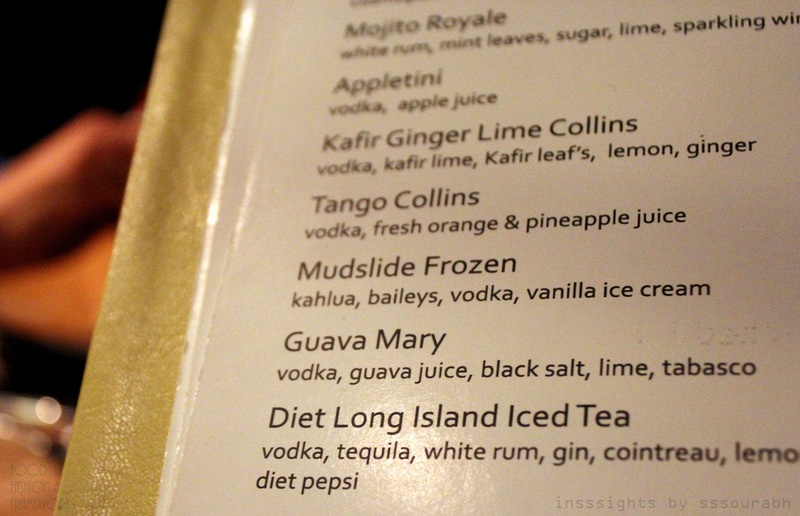 I always opt for offbeat cocktails, and most enjoy those that are localized with ingredients found in neighborhoods of proximity. 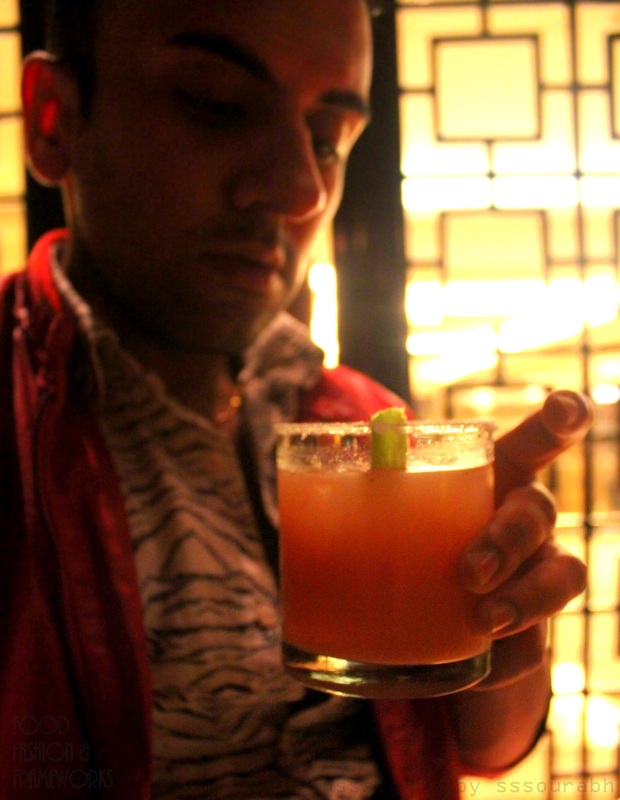 In this case, Dad and I opted for the Guava Mary, a succulent take on its namesake, replacing bloody red tomato with the ethereal pink guava juice. 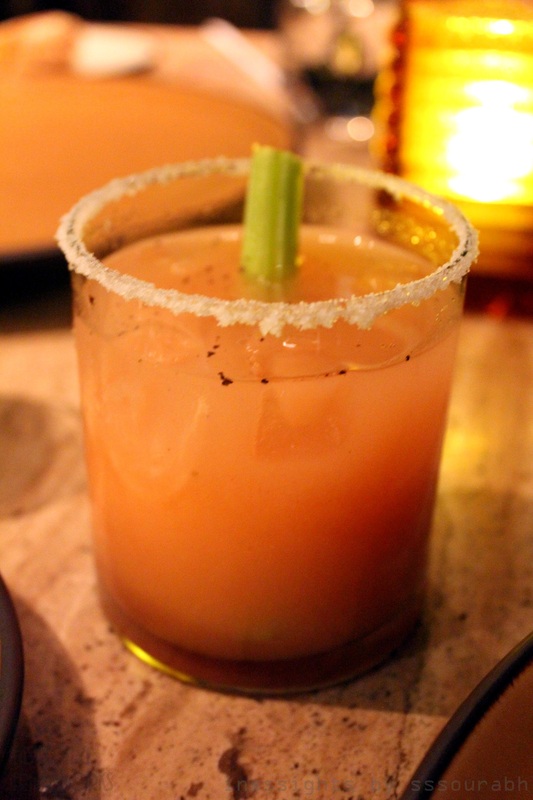 Vodka, black salt, lime, Tabasco and a celery garnish constituted the remainder. The result was a thick, fruity but punchy drink, owing to the spice and citrus bitterness of the salt and lime, and the tart depth of the vodka. 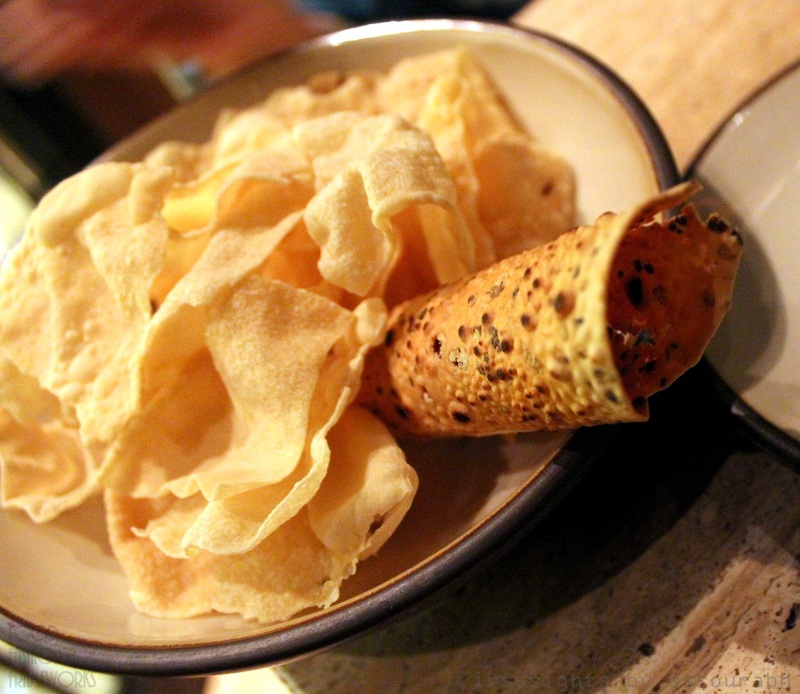 Accompanying these were the homemade poppadums, two rolled up and roasted, and the others classically flat. Both were sumptuous, the former laced with fennel and spices, and the latter like a lighter, fresher version of the otherwise dense tortilla fritter. I naturally went for the spicy one, accentuated by its whimsical, peephole inducing shape. 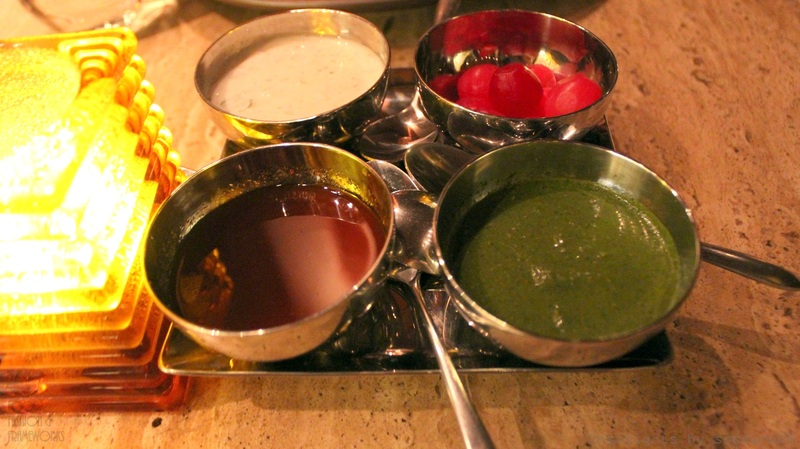 Infrequent dipping into the quad of sauces – coriander, tamarind, cherry tomato and coconut yogurt – were distracting without being too helpful, but I sure wasn’t complaining. 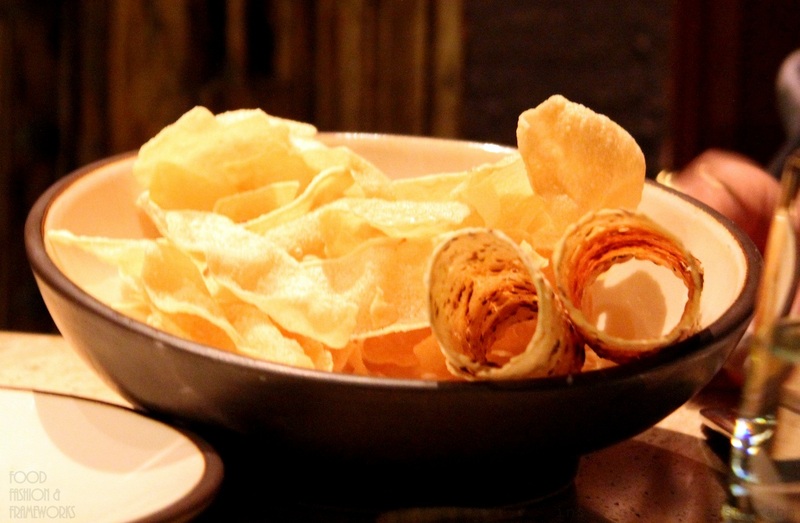 For mindless dipping is always a guilty pleasure. The mere memory of the appetizer makes every taste bud salivate. 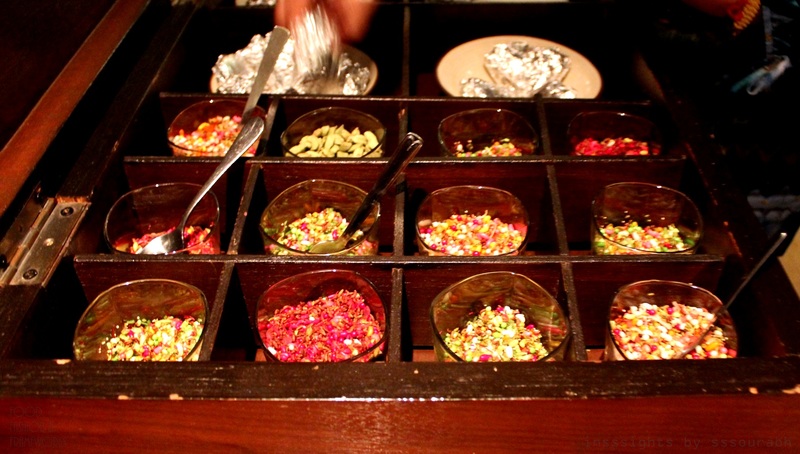 Fruit chaat is my favorite Indian street food that makes for a tangy, succulent, spicy and gratifying snack – usually made of chopped up cold fruit mixed in spices, tamarind sauce, citrus sprinkles and savory rice crisps. 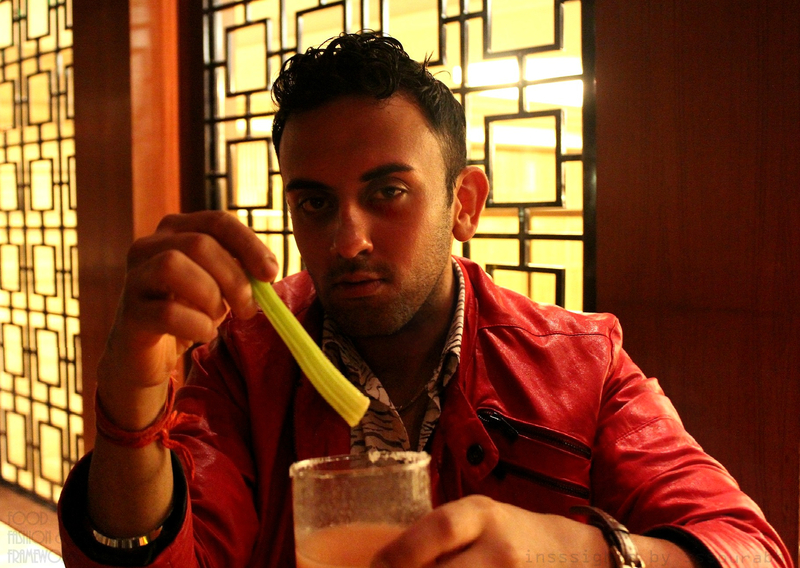 The remix at Saffron broke two of these rules in regal style: firstly, it was whole fruit (halved, not sliced), and secondly steamed. I immediately vowed to replicate both paradoxical, boggling innovations in the comfort of my own kitchen. 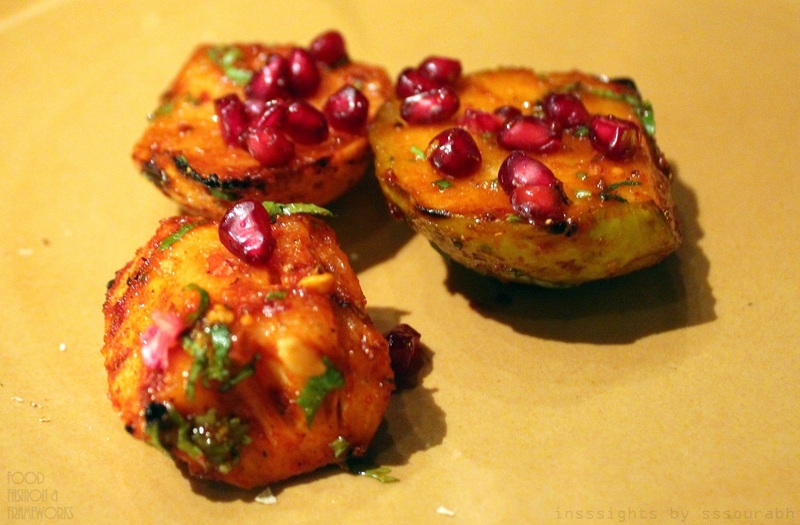 Warm to the core courtesy of grilling on a tandoor, the apples, pears and peaches were bathed in the red chili, sweet spices and tamarind, retaining the legacy of fruit chaat, but with char burn marks for flavor and plump pomegranate arils as a garnish. Not to mention, a hint of saffron that exuded a heavenly aroma. The charred burn marks accentuated the smoky flavor, making it a breathtaking, sumptuous bite. Mom and I ordered seconds, owing to our addiction to all things tangy. 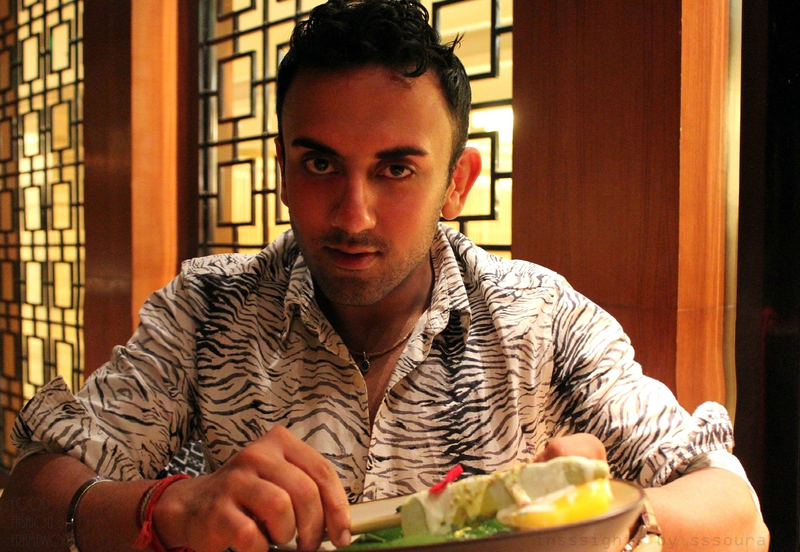 Evidently, this won my vote for one of the best dishes I’ve had in India off late, which is quite a feat. With such a high bar set by the fruit chaat, it was already going to be a challenge to replicate the success in the entrees. 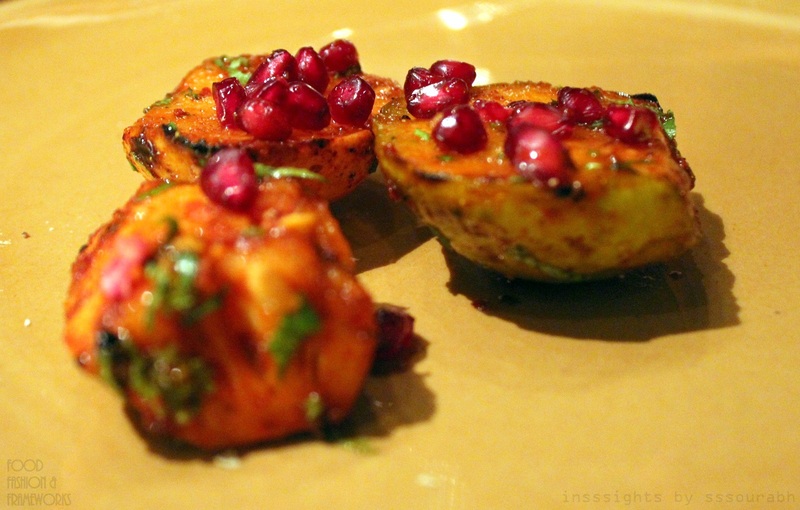 Nonetheless, despite a few hiccups, Saffron emerged successful with its typical Punjabi dishes. 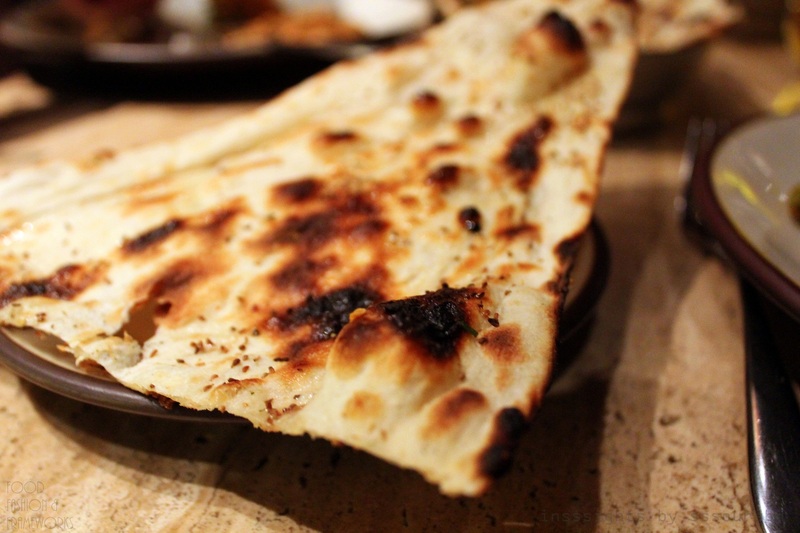 The aromatic naan was, as expected, perfect – neither chewy nor flimsy, but simply perfectly crispy on one side, and bubbling with burn marks on the other, with a squishy, happy interior. The tandoori roti was smoldering with garlic, onion and greens, giving it a flavor of its own that would make for a tasty solitary snack. 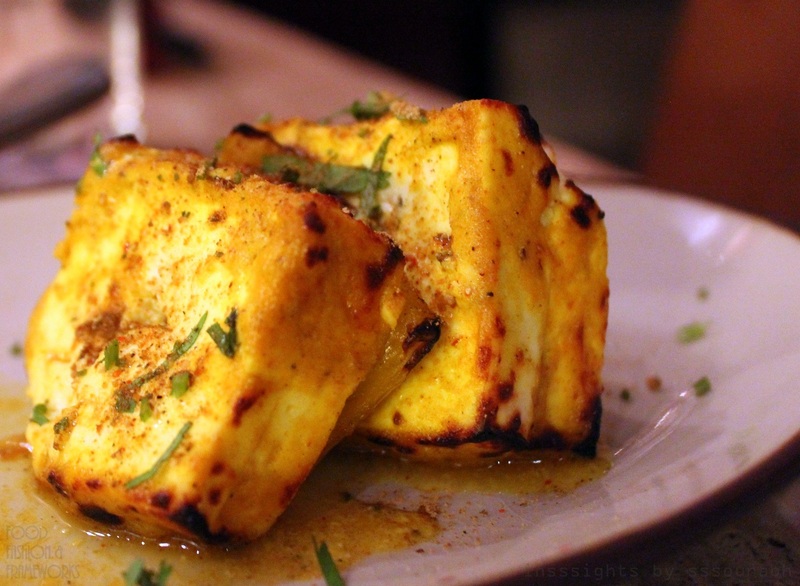 No Indian meal is complete without paneer, my favorite cottage cheese. 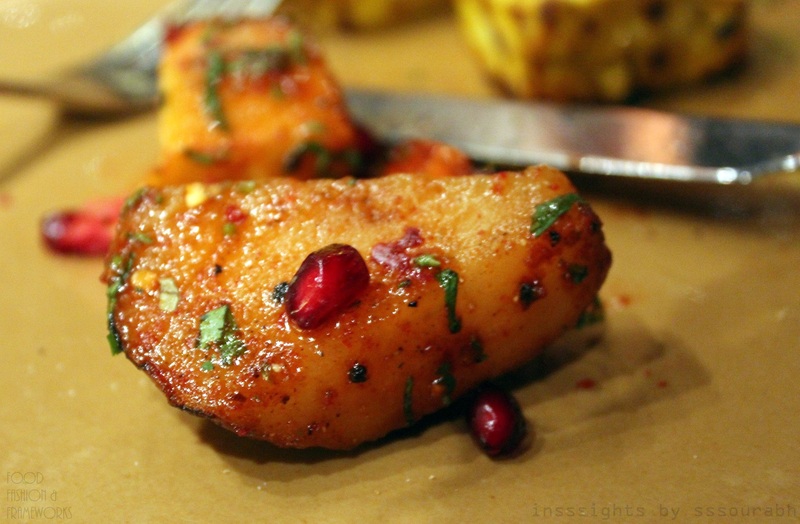 The dry, gravy-less, tandoori version arrived on a long platter with extra-large cubic slices that were perfectly golden, charred on the edges, and gleaming with herbs and red chili. Bouncy soft and tinged with lemon, it further solidified my affinity towards my favorite Punjabi fix. 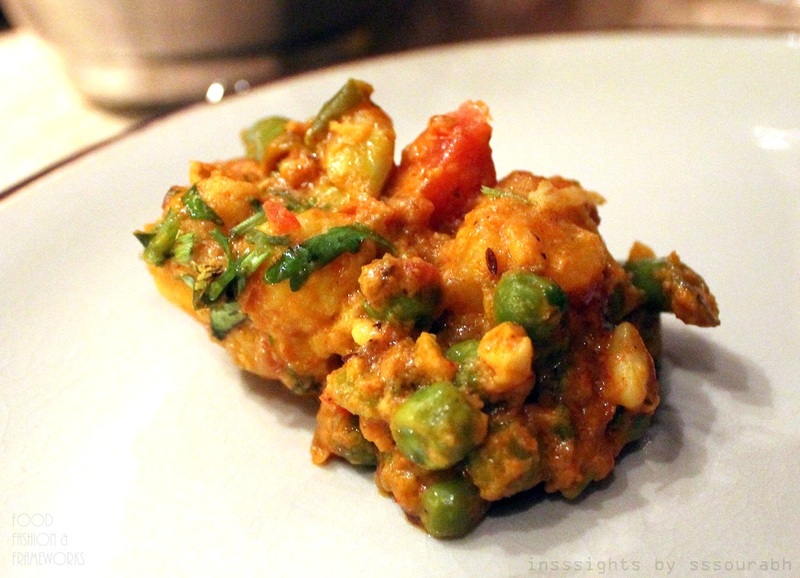 The jal frezi, a vegetable medley of steamed and fried peas cauliflower, tomatoes and potatoes, in a thick curry sauce, was a rendition of something I had been eating since my baby tooth days. It met expectations, with crunchy peas, snappy corn and fibrous asparagus, but neither was neither exemplary in visual aesthetic nor blissful in taste. 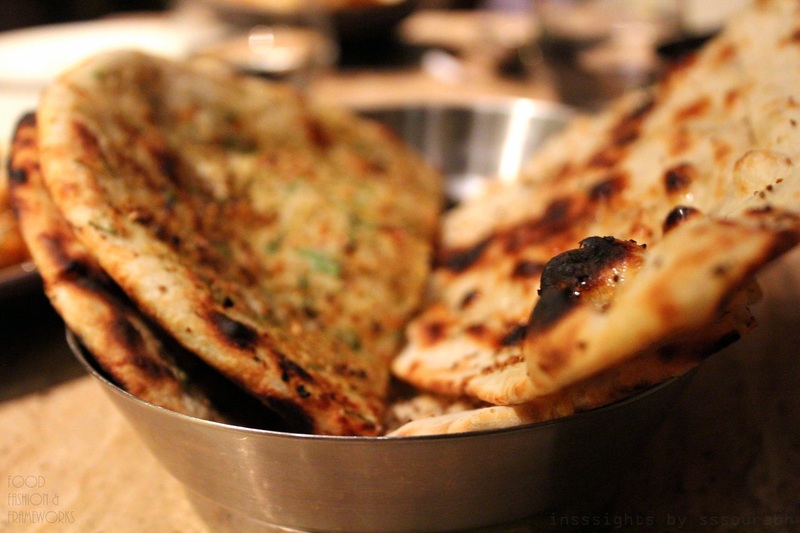 Nonetheless, it made for a happy accompaniment to my favorite naans! Chola, i.e. 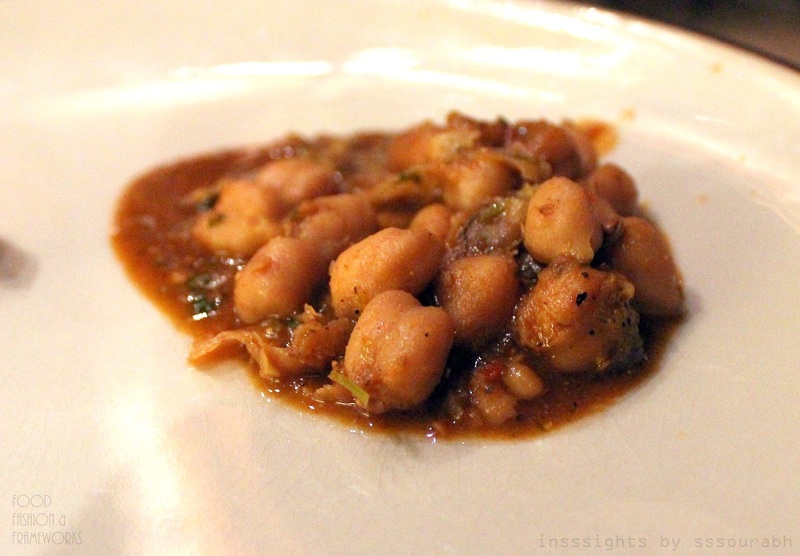 chickpeas in a tamarind, tomato, garlic and spice broth, has also been a regular performer in mom’s Punjabi kitchen orchestra since my toddler days. I’ve learned two measures of granting approval to chola: they should retain the entire shape of the chickpea when the eater gapes at them, and should melt gently in the mouth when inhaled. Plus, the dish should look solid or at most fluid, with no watery separation of the broth when plated, even in a flat plate. My biggest turnoffs entail the broth defying gravity and spreading sideways on a flat plate. The server recommended the chola as Saffron’s flagship dish, and it was nothing short of splendid, fulfilling my checklist, and brimming with heat emerging from its metal container. Not shockingly, I always order dessert. But my fear is always that it sometimes adds to the food coma that plagues me meal after meal. As a result, I consistently crave a consequential digestive. 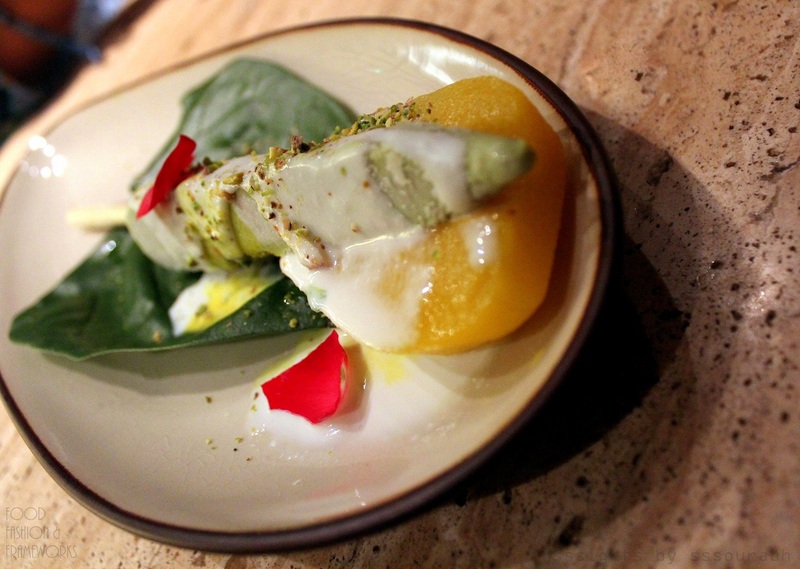 To my surprise, Saffron seamlessly married both my needs, as if foretelling my digestive fortune, with the paan kulfi. 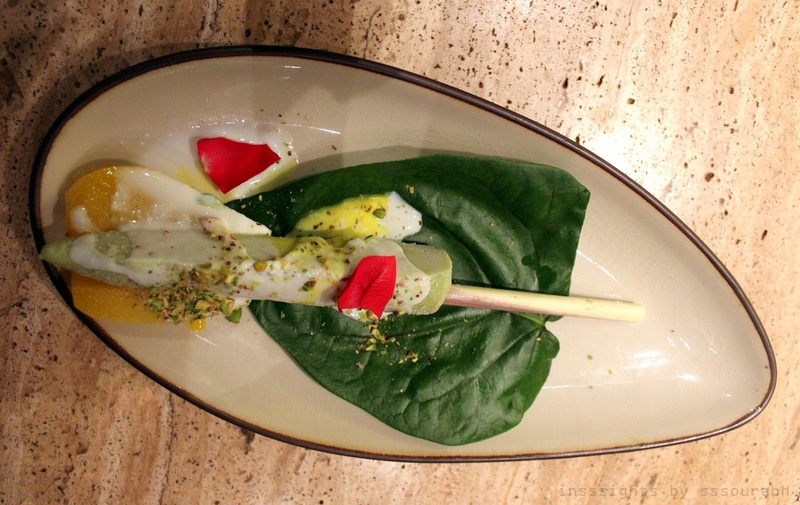 It was like witnessing the solemn union of the creamy, kulfi ice cream with classic paan, an addictive digestive of betel leaf enveloping coconut, fennel and sweet extracts. Extracting the paan flavor into the kulfi was a feat that definitely deserves honorable, sweeping mentions in my quest for quirky frozen flavors. I’d call it betel ice cream, owing to its whimsical, paradoxical nature. 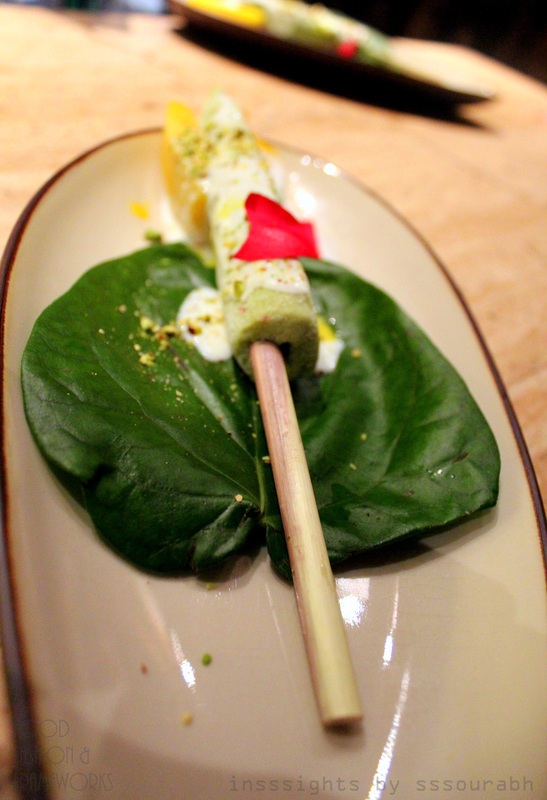 Moreover, what arrived was definitive eye candy – a raw betel leaf, perfectly emerald green, topped with a long, dainty kulfi on a stick, evoking nostalgic feelings from childhood. The green was a little too mild for a paan knockoff, and a little too much for a pistachio inspiration, but it was smothered with a sweet cream sprinkled with pistachio pieces. The tip rested lazily on a tart yellow peach, whose citrusy flavors were a welcome wisp of freshness next to the dairy overload. 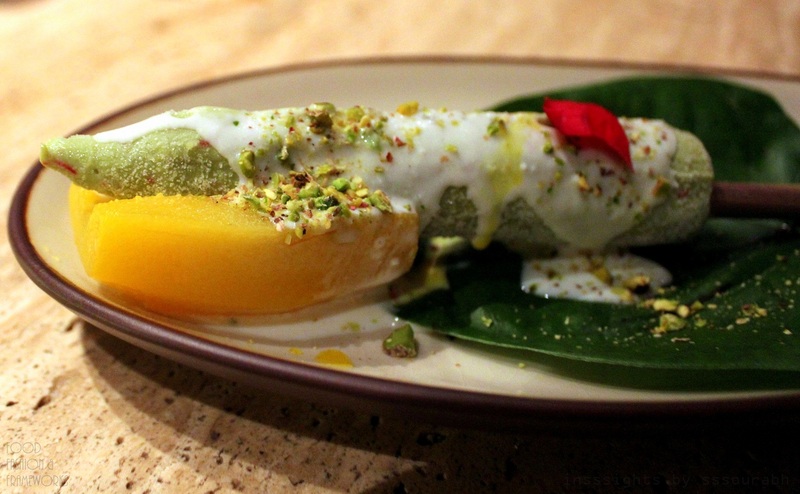 Sprinkling it with red edible florets, roses no less, completed the package as a colorful, luxurious and severely tasty marriage of kulfi and paan. 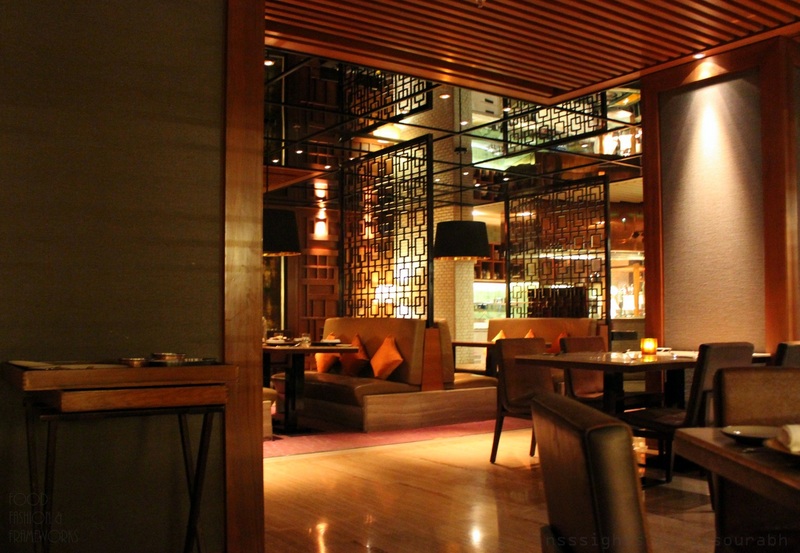 After slurping through the colorful palette of dessert, we ventured through the mahogany wood carved walkways to the intriguing Whiskey Bar within the hotel. But not before being whisked towards a treasure chest with crevices holding a variety of fennel, licorice and gourmet mixtures of saunf, a healing and indulgent digestive. And bejeweled in silver, completing the royalty theme and like a whimsical nod to our true loves, was a crevice filled with a plethora of paans. The hospitable staff did not mind as I gleefully lunged into the varieties. And so we tumbled out, photographing our opulent surroundings and our fashionable selves within it… hoping that every step was not met with an abdominal wobble of joy. 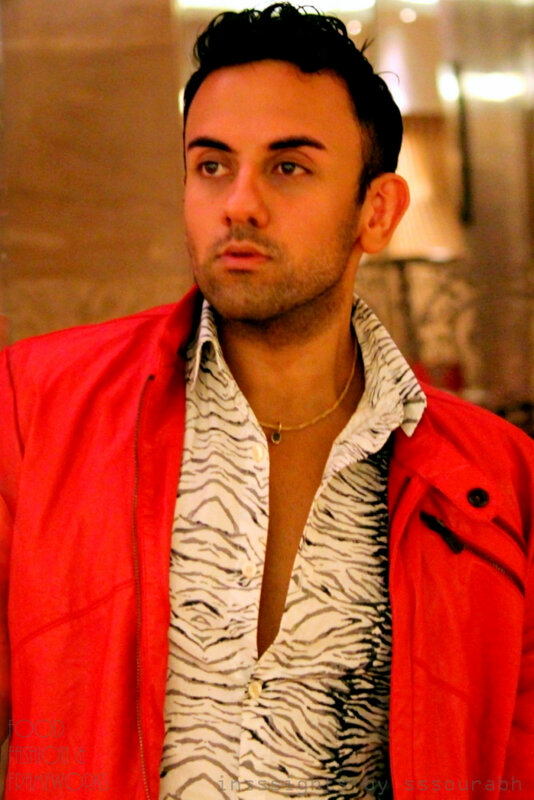 While slowly becoming inevitable, the juxtaposition of food and fashion could not be more transparent! 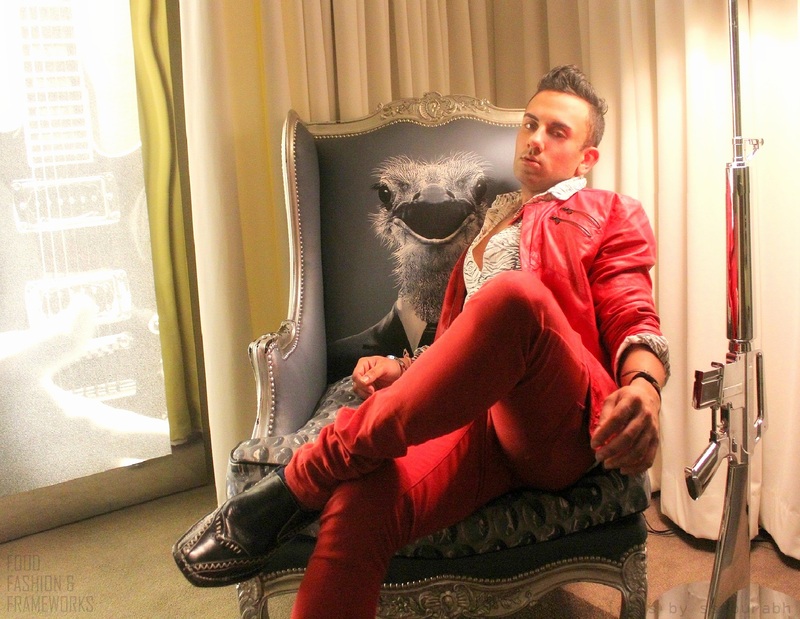 Love this article – it makes me want to go to India! 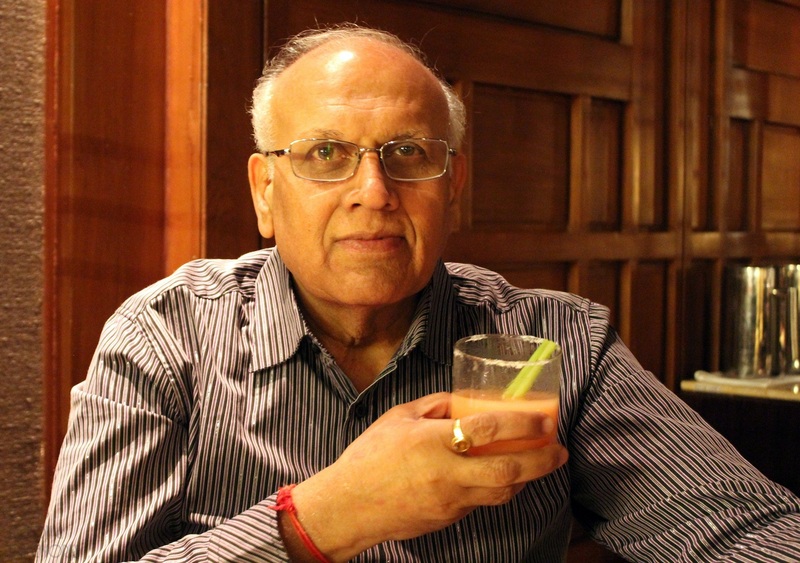 You are a very gifted writer and a true food hedonist! 🙂 This makes me so hungry! Very beautifully written!